Women’s denim midi skirt from Maison Margiela’s diffusion line MM6. 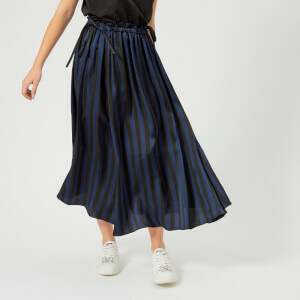 Cut from blue cottom denim, the ‘80S Wash Denim’ skirt comprises a full-length concealed zip fastening beneath a button-secured front flap that hangs, exposing the interior fabric. Featuring a thin waistband with multiple belt loops, stitched pleats to the front and back and a frayed hem. Finished with a woven brand label to the inside waist.